This post was sponsored by I Like That Lamp. This project and all opinions are my own. This post also contains affiliate links. If you make a purchase using those links, I may receive a small percentage at no additional cost to you. See my full disclosure here. Thrift stores and yard sales are my favorite place to find really awesome lamps. New lamps are crazy expensive but you can find really beautiful and unique lamps secondhand for super cheap. The problem is they usually have either ugly, outdated shades or no lampshades at all. That doesn’t sound like such a big problem but it can turn into a huge headache. 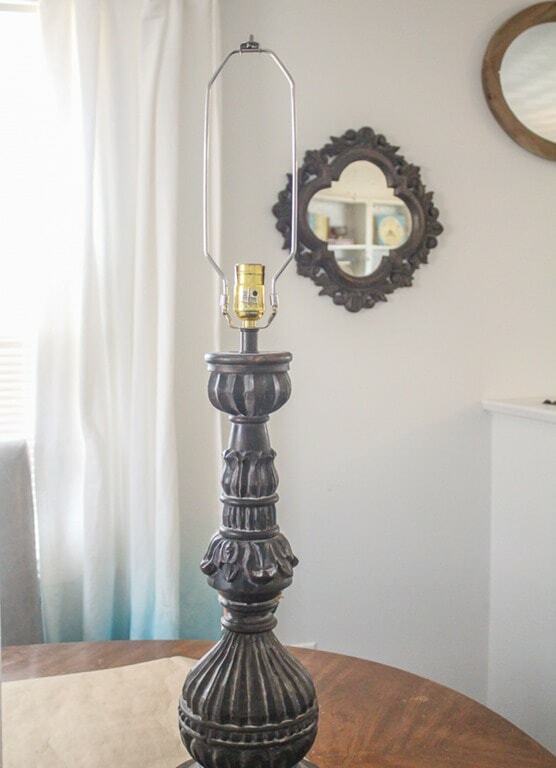 A couple of years ago I found a gorgeous pair of turquoise lamps at a thrift store. I was so excited because not only were they beautiful, but finding a matching pair is a total score! Of course, they had no shades, but I figured I’d pick up a pair of new lampshades at Target and problem solved. Except problem not solved. All the cute drum shades I found at Target and my other usual spots were the wrong size. It took me over a year to find a pair of lampshades that would work with my beautiful vintage lamps. Well a few weeks ago, I found another fabulous pair of vintage lamps at a local thrift store. Of course there were no shades, but they were tall and curvy and beautiful. And only $7 for the pair! So it seemed like the perfect time to learn how to make a lampshade. I wasn’t totally sure how it was going to turn out. I’ve tried to make my own DIY lampshade once in the past and it didn’t turn out so great. It looked good from a distance but up close, it was kind of a mess. 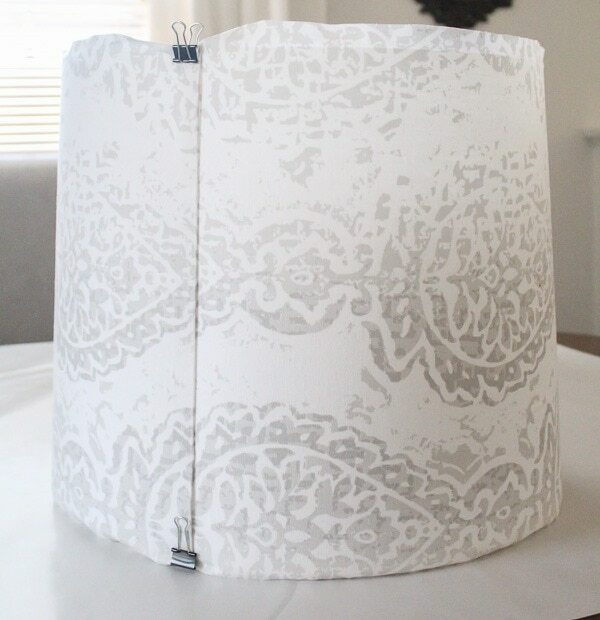 But I wanted to give making a lampshade another try and this time I had two huge advantages – I was using real lampshade parts and I had great instructions to follow. So yeah, it’s probably no surprise that it turned out 1000 times better. 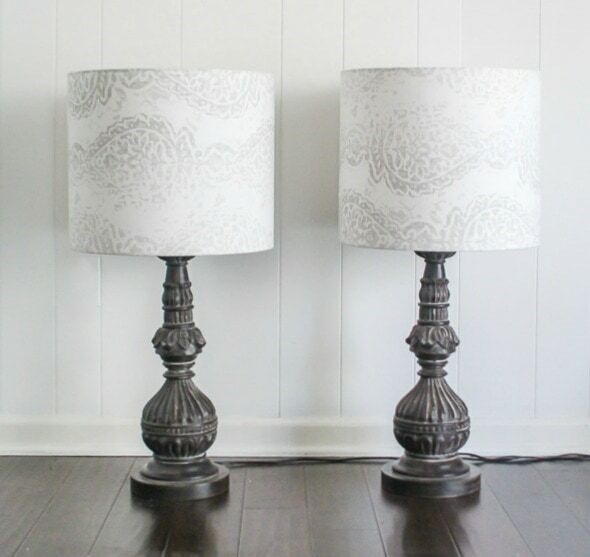 This time around my DIY lampshades look exactly the way I pictured them. 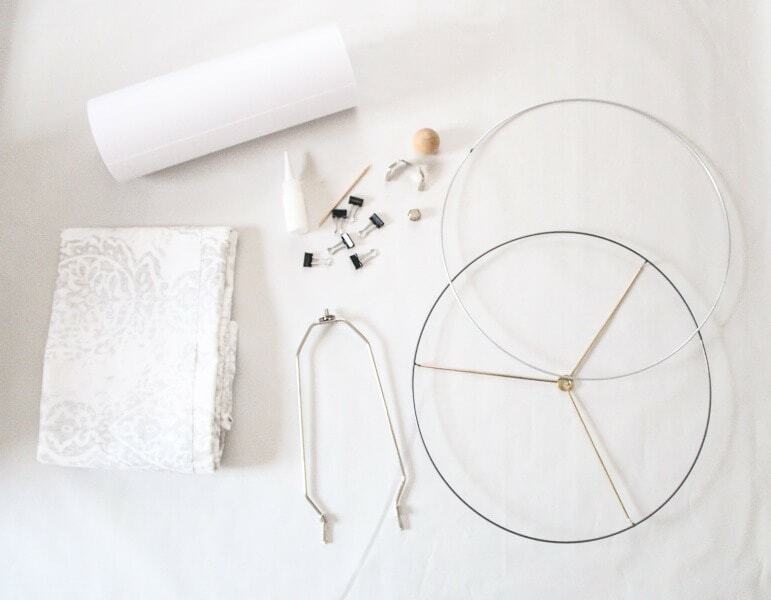 Before you start making your lampshade or even order your supplies, you need to measure your lamp to figure out the correct size (both height and diameter). 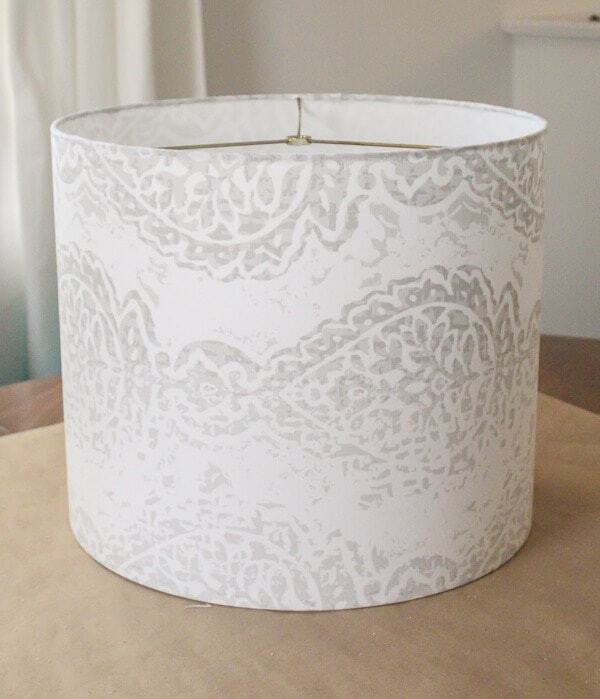 It may seem like a small detail, but the right size lampshade makes a huge difference to the look of the finished lamp. I Like That Lamp has a really good guide to figuring out what size lampshade you need right here. 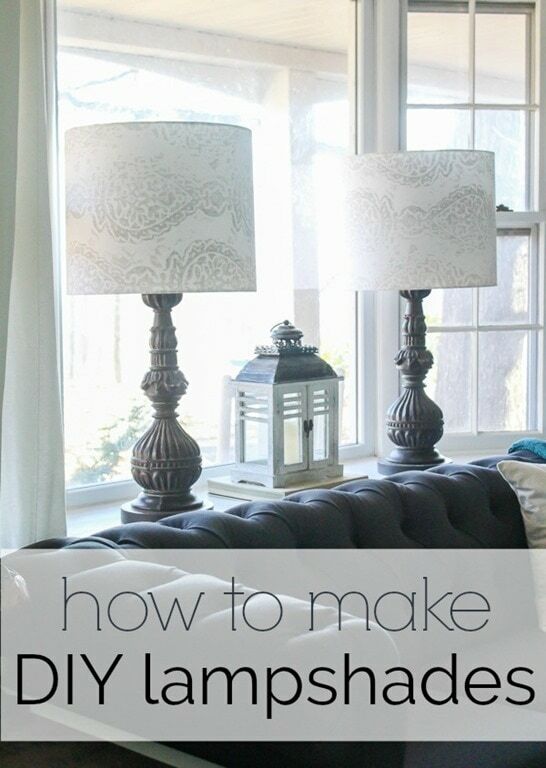 I followed this video tutorial from I Like That Lamp when putting together my lampshades and it was really helpful. But if you prefer written directions and tips, read on! You may need to trim the length of your styrene sheet before you begin. (Styrene is the stiff material that gives the lampshade its shape.) Just follow the size guide linked above to figure out how big it needs to be. 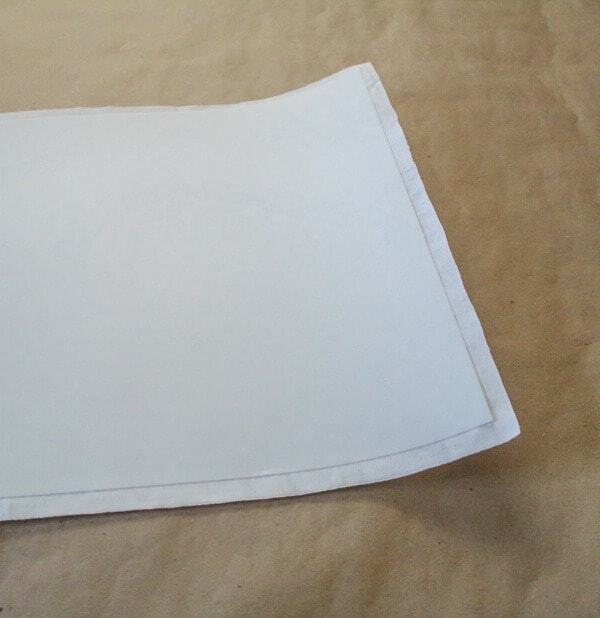 Lay your fabric out on a flat surface and stick the styrene sheet to it. One side of the styrene is sticky so you simply peel the protective layer off the styrene slowly while unrolling it and sticking it onto the fabric. 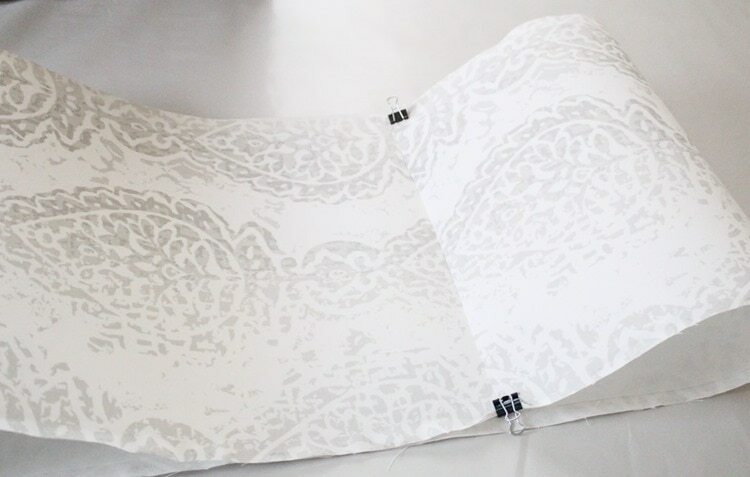 Trim the fabric so that there is a half inch border of fabric above and below the styrene. Also leave a half inch border on one of the short ends but cut the other short end of the fabric flush with the styrene. Fold the extra fabric from the short end over the styrene and glue it there with lamp glue. Fold the fabric/styrene into a loop and use a binder clip to secure it together. The short end with the fabric border should be on top. Set the lampshade up. Slide the ring with the washer into the lampshade. 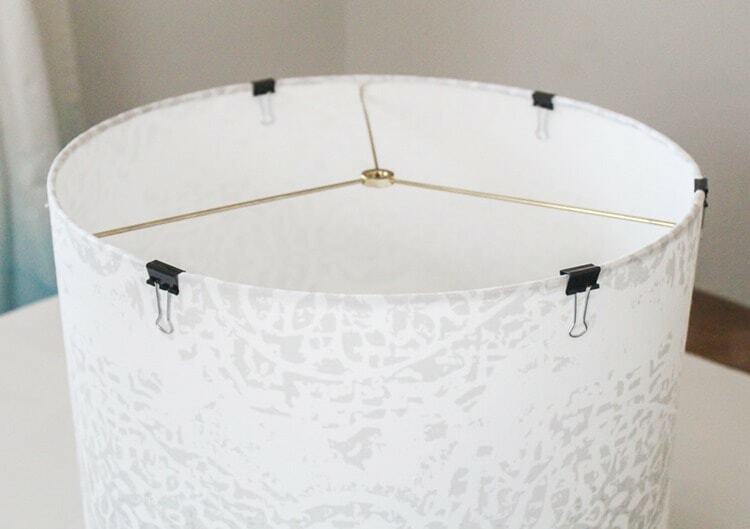 You might need to adjust the size of your lampshade so that it fits snugly around the ring and hold it in place using binder clips. 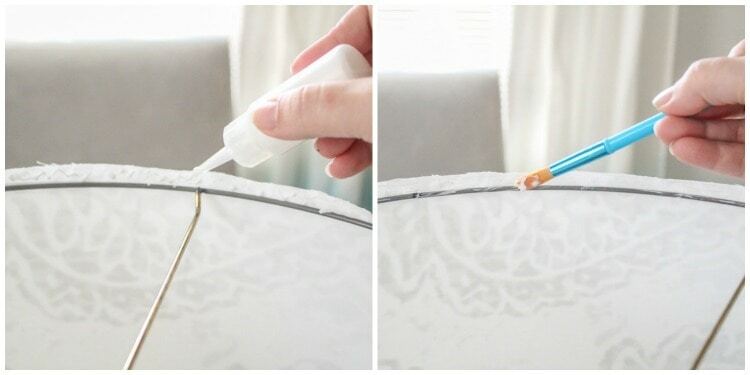 Add glue to the excess fabric around the top of the shade in small sections. Use a small paintbrush to spread the glue to cover the fabric as well as the metal of the ring. The glue will become tacky after a few seconds and then you can fold it over the ring. Use the binder clips to help hold it in place while you move on to the next section. Flip over the shade and repeat the same process on the bottom using the plain wire ring. Finally add a little glue to the seam going up the side of the lampshade. The whole process took about an hour for my first lampshade. Once I knew what I was doing, the second went a bit faster. Then they are ready to attach. If all you needed was a lampshade then you’re set. 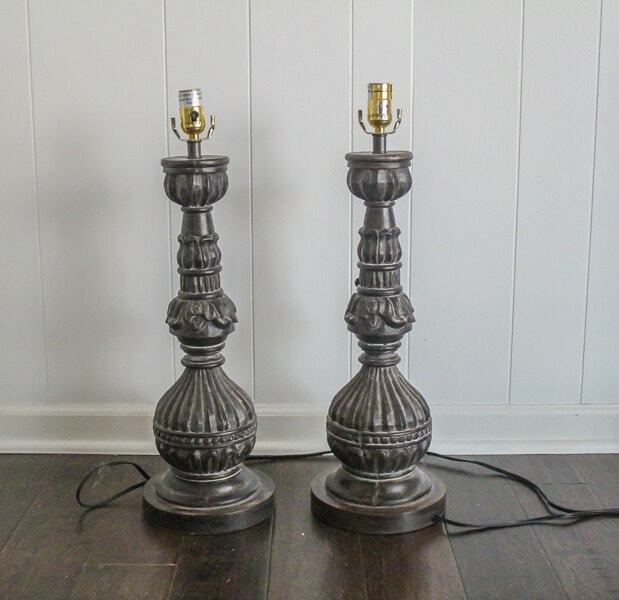 I also added a lamp harp set to each of my lamps to support the new lampshades. Here’s the finished product! 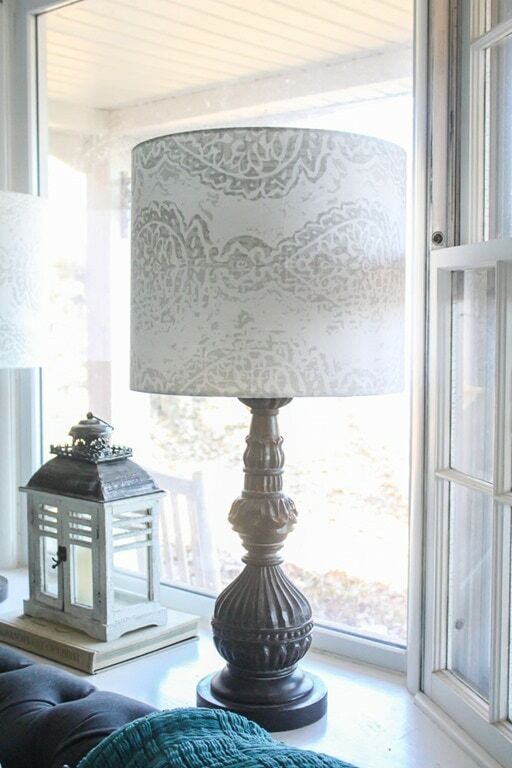 I am so happy that I learned how to make my own lampshades. Now I have a pair of completely custom lampshades and my $7 lamps look like a million bucks. Originally I was planning to paint the lamps themselves but once the new shades were on, they really didn’t need any other updates. 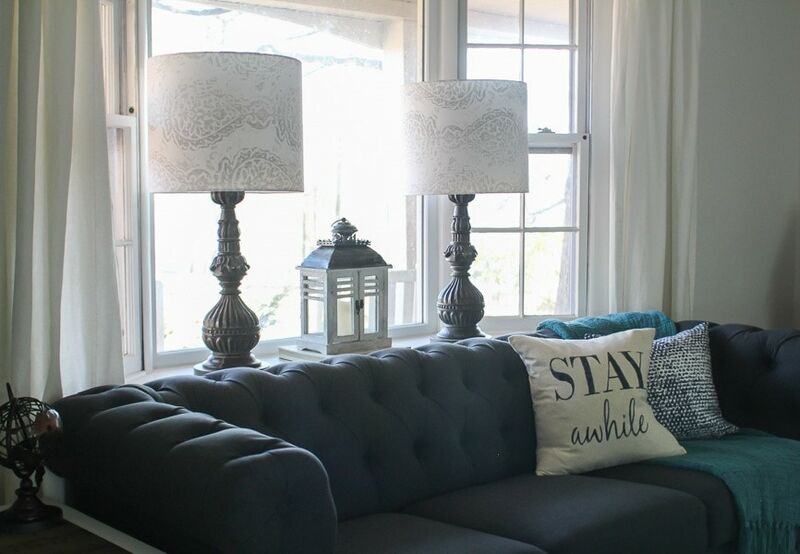 These lamps came at the perfect time since I stole the lamps that were in here for my $100 family room makeover this fall. This pair is perfect in here. Ok, so who else has been hoarding old lamps waiting for that perfect lampshade to come along? 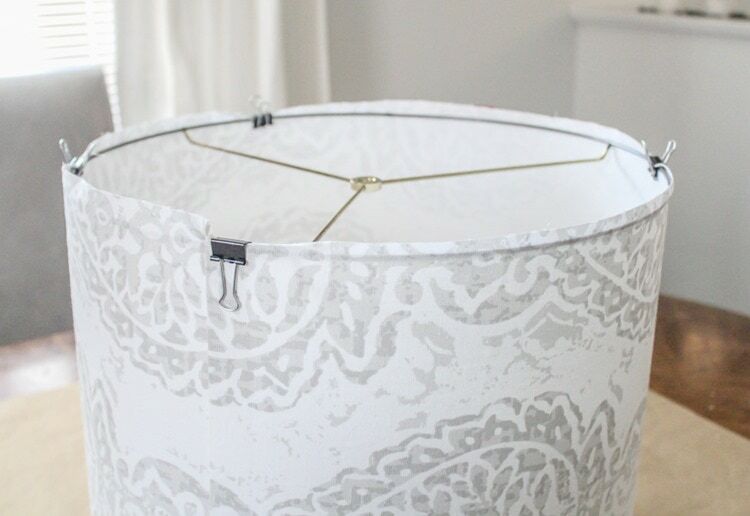 Clear out the hoard and create the perfect custom lampshade! And don’t forget, I’ve got a great coupon to help you along in your lampshade making. When you buy any of the lampshade parts linked in the materials list above on Amazon, use coupon code RQQYZBC5 to get 10% off. Woo-hoo! I have serious lamp shade issues at my house! Long story! But my lamp shades are smaller at the top and larger at the bottom. How do I do that? I have always had lampshade issues too! I think it’s because I love to find cool thrifted lamps and the shades are never very nice. 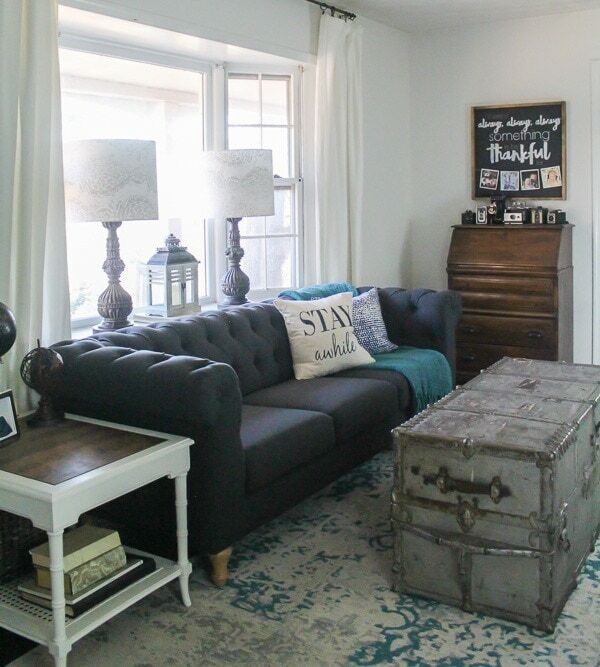 You could always switch to a drum shade style where the top and bottom are the same size. But if you don’t want to change the style, it looks like I Like That Lamp only sells the rings in sets of two of the same size. Possibly you could buy different sizes somewhere else. If it was me, I would be tempted to dismantle the shades I have and reuse the rings, although that make it difficult to use a straight piece of styrene/fabric. Like you, I had no idea there were lamp-making kits. Thanks for the tip. Yours turned out beautifully. Thanks so much Jane! I seriously want to make new lampshades for every lamp in my house now – but I’m trying to show some self-control! Lovely. I will start on mine 2morrow. Guess it will take me much longer! Can i just use a glue gun for it, instead of lamp glue? Hi Maidy, I don’t know why but I have always struggled with glue guns – half the time I just end up with a big lumpy pile of glue! But any glue that works on fabric should work fine. The lampshades that I have are a bit bland and old. I’m looking at going with some new ones here soon. I’ll probably see about attempting to make some first before I decide if I want to buy some. Making your own really is easy and worth looking into!